You can combine tourism and culture during your stay in the rural setting of La Tour d’Herbain with harp and/or singing lessons given by mezzo-soprano and harpist Rachel Ann Morgan. It is possible to take private lessons or participate in a course for a small group. In the surroundings of guesthouse La Tour d’Herbain you can go on cycling trips and go for walks in the friendly countryside. 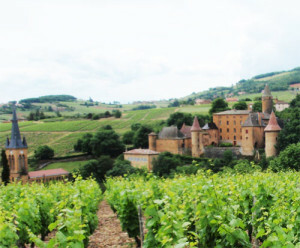 You can visit Beaujolais vineyards and taste their wines, enjoy Pérouges, one of the most beautiful villages of the world, see castles, parks and rose gardens. The famous abbey of Cluny should not be missed. The town of Villefranche-sur-Saône is just 4 km away and the city of Lyon, known for its culinary highlights and historical sites, is 35 km to the south.